I was first introduced to this yearly updated book this summer when I heard about it on a blog I was browsing through. I went straight to my local library to check it out and of course (since I live in a “small” town) the library only had an outdated version (2010) .I checked it out anyway. It didn’t take me long to realize the treasure trove that it was and I was eagerly awaiting the arrival of the 2014 Writers Market to hit the shelves. Thankfully my dear Mother bought it for me for Christmas. This 921 page reference book was written by the Writers Digest Team and Published by Writers Digest Books. It is the most trusted guide to writing books out there today. The website for Writers Digest is filled with so many incredibly useful articles and resources on everything a writer needs to know, no matter what genre you write in. 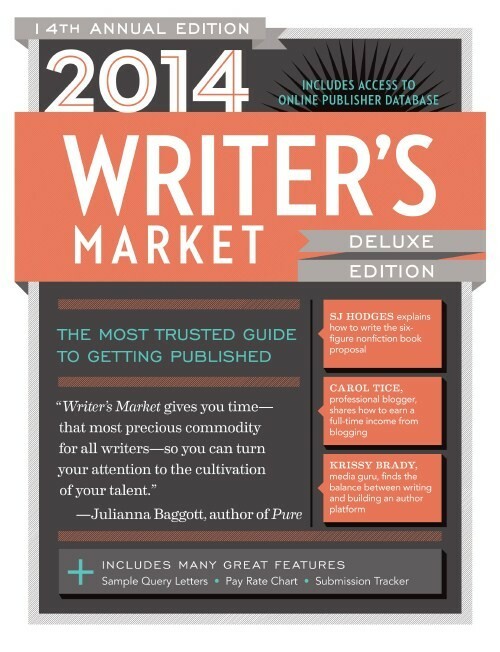 The 2014 Writer’s Market Deluxe Edition details thousands of publishing opportunities for writers, including listings for book publishers, consumer and trade magazines, contests and awards, and literary agents. These listings include contact and submission information to help writers get their work published. Look inside and you’ll find page after page of all-new editorial material devoted to the business of writing. It’s the most information ever jammed into one edition! You’ll find advice on pitching agents and editors, finding money for your writing in unexpected places, and promoting your writing. Plus, you’ll learn how to navigate the social media landscape, negotiate contracts, and protect your work. And as usual, this edition includes the updated ever-popular pay rate chart. • A free digital download of Writer’s Yearbook featuring the 100 Best Markets, including a self-publishing checklist, submission tracker, family tree of the major book publishers, and helpful charts. I love the Writer’s Market handbooks. I feel they are invaluable. It’s true you can get pretty much the same information on their website. However, it’s handy to have a physical book to reference where you do not have to sift through hundreds of articles in the archive section of the website. The 2014 book also comes with handy samples of queries for magazines, books, a list of the major publishers and all their imprints, a submission tracker form, and a guideline for how much to charge. Not to mention extensive contact/submitting information from agents, publishers, magazines, trade journals, contests and online markets. That being said, this is not my favorite version. The articles, though helpful and entertaining tended to repeat themselves and in some instances contradict themselves, slightly. In the 2013 version it included an extensive index that showed you where to find agents, publishers, etc according to genre. That was extremely helpful and much appreciated since your eyes can get glossed over after a few hundred pages. I was disappointed to see that the 2014 version did not have this index which made finding the agents, publishers, etc… that are looking for pieces in my genre really time consuming and headache inducing. This almost makes up for the crappy Index…. almost. All in all, I would recommend the 2014 Writer’s Market Deluxe Edition because it really is worth the price and with the 1 year subscription code even more so. Do you use the Writers Market Handbooks? Have you purchased or looked through the 2014 version? Were you happy with it? If not Why? Do you recommend another book like it? This entry was posted in Writing Resources and tagged Amazon, Book Review, Brenda Collins, C. Hope Clark, Carol Tice, Carol Topp, Cindy Ferraino, Darla G. Denton, Debbie Ridpath Ohi, Eva Shaw, J.M. Lacey, Jane Friedman, Jeff Goins, Jen Michalski, Joanne E. McFadden, Karen M. Rider, Kerrie Flanagan, Krissy Brady, Lynn Wasnak, Marc Acito, Robert Brewer, S.J. Hodges, Sage Cohen, Sue Bradford Edwards, Wiley Cash, Writer's Digest, Writer's Market, Writing Resources. Bookmark the permalink.